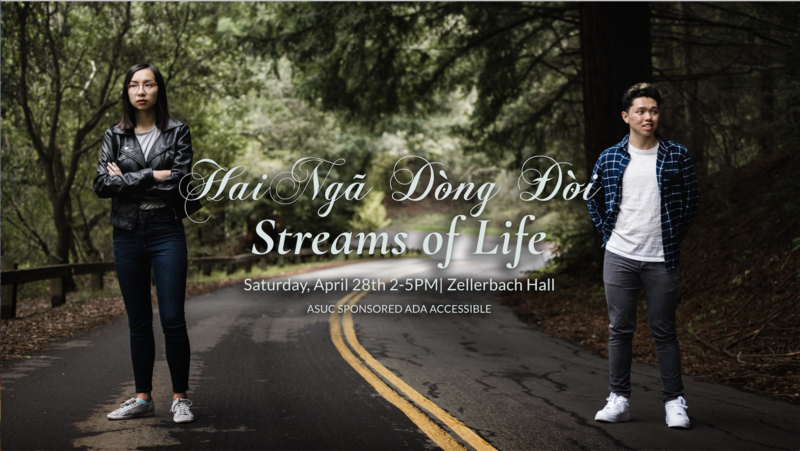 On Saturday, April 28th, 2018, the UC Berkeley Vietnamese Student Association held our 39th Annual Culture Show, “Hai Ngã Dòng Đời / Streams of Life” on the world- class Zellerbach stage with with an audience of 1100+. Our show had several purposes: to explore social, political, and environmental issues in contemporary Vietnam, to commemorate April 30th, 1975 The Fall of Saigon, and to educate the community by bringing together many talented Vietnamese and non-Vietnamese individuals to tell our stories. The production consists of 110 members, including 32 members who comprise of our CORE team to plan and execute our show behind the scenes. Starting from January, we promote our event with photos and videos teasers across multiple social media platforms like our personal website, YouTube, Snapchat, and Instagram. Our members collectively change their profile pictures, and posted countdown banners in preparation for the show. We also used Facebook to promote all of our fundraising events by inviting people to our events and sharing them. As another marketing strategy, our public relations team also distributed flyers and posters in our school, as well as outside communities in the Bay Area, particularly in cities with large Vietnamese populations such as San Jose and San Francisco. Our show is continuously revised after every All Cast, where our members would do two full run throughs of the show every two week for 3 months prior to show day. The process does not stop after the show is over. After show day, we had our last CORE meeting and banquet to come together one last time to discuss the positives, negatives, and improvements. We keep a record of this meeting for future use. This year our show fell on the weekend of Black April. We used this opportunity to commemorate April 30th, to honor our parents’ generation for fleeing their homeland so we can have a better life, also to mourn and remember the lives lost during the war and the journey to freedom. We also explored the environmental issues of the 2016 Vietnam Marine Life Disaster because the Formosa Ha Tinh Steel discharged toxic industrial waste illegally into the ocean through drainage pipe. Through the journey of the two cousins Phượng and Long, we hope to examine the social issues as they journey through Vietnam to get back their homeland. We posed the question of if we should act, or sit idly by in today’s political and social environment. Culture show is a space that helps our students showcase our talents, spread awareness and clarify the misconceptions about our culture in order to bridge the gap between the Vietnamese, Vietnamese-American, and American cultures. Our culture show’s goal was to not only educate and promote the Vietnamese culture and topics relevant to our community like Formosa, but also highlight a contemporary topic that needed a platform in this day and age. Through this program, our members were able to perform in various performances in front of 1000+ audience members, or through leading a team of 20+, or learning about a culture and history that they never had the opportunity to prior to this. We were able to bring awareness on the issues of Formosa to a larger audience of UC Berkeley and across the Bay Area. Compared to previous years, our Zellerbach venue cost was raised significantly higher, up to $27,000. We considered switching to alternative locations but they could not provide similar technical standards nor seatings such Zellerbach Stage. Besides applying for school grants, we reached out to sponsors, worked at concessions and hosted new fundraisers where we partnered with local restaurants and boba shops. During events like Cafe Sua Doggy, we partnered with an organization called Destress with Dogs. Students would support us by buying Vietnamese Coffee while hanging out with Berkeley’s most popular furry friends. Through a collective effort, we sold a record of 1200 Show tickets and paid for the total venue fees. In addition, every performance team was able to afford their own uniform this year through their own fundraising efforts. Since our show was on the weekend of Black April, we wanted to commemorate it. However, a lot of our students were international or were not comfortable with affiliating with certain political or social issues. Due to the sensitive topics of human rights, government corruption and police brutality, we did not want to force the story’s implication on our members. These issues were heavily discussed amongst our CORE and Cast to ensure our members’ safety — members only participated in parts that they feel comfortable and safe in. There were also more gratuitous amounts of violence which we caught in the revision process and during All Casts. Through all these issues, we grew closer as a team and were able to openly communicate amongst production team, writing team, CORE, and the rest of performers. This year Culture Show had an incredibly rough start. Two of our Producers stepped down from their position due to academic and personal conflict. A production team of three became one. After talking to our VSA executive chairs, we almost agreed on not having a show due to lack of a team. At this point, there were only two days left before we have to sign our contract with Zellerbach, but there was no production or CORE team. We decided to sign with Zellerbach despite the bleak future ahead. Instead of abandoning Culture Show altogether, our assistant producers decided to step up. The production team of five meet every week for 1-2 hours to discuss challenges and ideas for improvements. Together we finished recruiting a CORE team by the end of the fall semester for the first time ever. In addition, with the help of our CORE, VSA Cabinet, and our community, we were able to adverse this huge challenge and execute Culture Show to the best it can be.